The staff are employed by Serco, who won an £600 million contract to provide services at Barts. Staff at Mile End Hospital, Royal London Hospital, St Bartholomew’s and Whipps Cross have all taken part in the action, with vibrant picket lines outside their workplaces. The ballot over strike action by Unite came back with 99% in favour in June, and was followed by a 48 hour strike at the start of July. Workers plan to escalate to a 14-day strike from 25th July if their demands for a pay rise are not met, with more industrial action planned for August and September if necessary. Serco made profits of over £80 million in 2016, and low paid hospital staff are demanding the 30p per hour increase to recognise the vital contribution they make to hospital care. Serco management said they were "disappointed" at the strike action, because the cleaners already earn London Living Wage. Domestic staff employed by Serco at the Royal London Hospital staged a wild-cat strike three months ago after their morning breaks were cancelled with no notice, with 120 staff walking out immediately and barricading themselves into the canteen until the break was reinstated. Serco’s massive profits come from privatisation and outsourcing – as well as large contracts throughout the NHS, they run prisons, detention centres, school inspections, speed cameras, the National Nuclear Laboratory, and Boris Bikes. 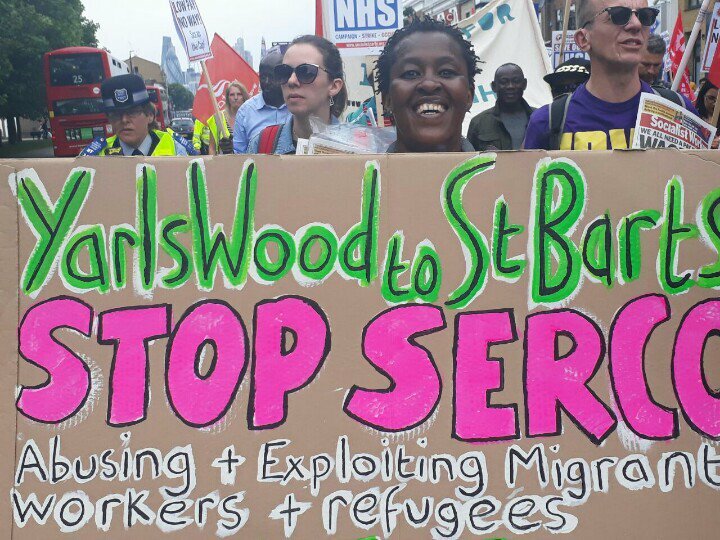 Solidarity with the striking workers at Barts has been expressed by campaigners against the notorious Yarls Wood detention centre, also run by Serco. Thank you for this important contribution about a strike that seems to be neglected by libertarian and international communists. This news item and a more recent article in The Guardian have been used as sources for an article in Dutch language. Though it is encouraging that this vulnerable part of the proletariat has come into action, I'm worried about the long duration of the strike and its lack of extension to other workers in hospitals or to low paid workers in other sectors in the London region. Clearly the union contains what has started as an autonomous action. I don't work in the health sector so all I know is based on talking to people when I have been down to the picket. I am not an expert so if anyone knows better please jump in. I think part of the reason the strike has been going on so long is the cleaning is being done by agency workers who have been brought in from all round the country. There was an occupation of the agency office because of this. Actually there are quite a lot of strikes by low paid workers in London at the moment and I have seen people from those other struggles down at the hospital, there was also a joint protest by three different strikes with hundreds of people. Thank you for giving some info from the streets of London. with some extreme racist comments from their 'readers'. I hope that more individuals based in London will give info on Libcom about this strike, and that more and more workers understand its strong and weak points, and act accordingly!